Please see a list of Frequently Asked Questions for The Spread Your Wings Project below. Contact us if you have any questions that are not addressed below. Follow our community online via Facebook, Instagram, or YouTube for more information. 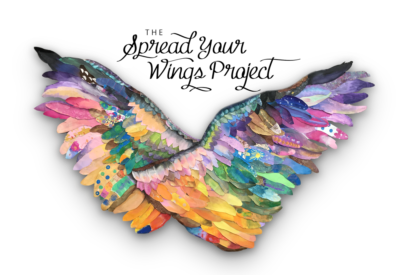 The Spread Your Wings Project is a creative platform founded as an uplifting response to the numerous challenges and tragedies we face today. It implements the benefits of Art and Art Therapy to unite families and communities through Hope, Love and Courage. How does The Spread Your Wings Project Work? It works by involving the community Iarge-scale art and community arts projects. Problem-solving through the arts is an inspirational, therapeutic and powerful way to unite communities. The Spread Your Wings Project responds to individual and community causes that we believe can benefit by our community and public art endeavors. Each year, we select a cause to feature and support through art and merchandise sales and cash donations. How do you choose the causes you support? There are so many worthy causes that need help, and the choice is never easy. So far, the causes we have supported have landed on our doorstep, and we believe that will continue. How did The Spread Your Wings Project begin? The Spread Your Wings Project began with a very special young man, Benjamin Daniel Breedlove, who passed on Christmas Day, 2011 at the age of eighteen. In his last days, Ben privately created a two-part video, entitled, “This is My Story,” where he used flashcards to tell the world about his near-death experiences and the peace and hope of Heaven. This video went viral and has had over 15 million views. We were led to Ben and the Breedlove family, and inspired to continue sharing Ben’s message through our work. Watch the video and read the full story here. As a 501(c)3, cash donations are deductible to the full extent of US law. Our federal tax ID # is 82-5100565. How long does a current cause appear on your site? We have two areas on our site: one for our current cause and one for previous causes. Current causes run for the campaign duration, and previous causes remain on our site in perpetuity to raise ongoing awareness for them. ORIGINAL ART: 100% of original art is tax deductible, as The Spread Your Wings Project and the artists keep zero percentage of revenues. PRINTS: Prints are purchased through a 3rd party vendor and only $20 of any print is tax deductible. MERCHANDISE: Merchandise purchases are through a 3rd party vendor and $5 of each purchase is tax deductible.